This two storey property has recently been given a much needed face lift! The whole interior has been painted and a brand new kitchen fitted. The property is ready to move into, so you just need to move your furniture in. There is a gated entrance that could be made automatic if wanted. There is parking for two cars but there is more space outside of the walls if needed. The property’s garden is nicely set out with cute little paths wrapping around it and a vast variety of shrubbery and trees. There is a lovely covered patio area joint onto the house which is a great place to sit and relax in the shade. There are two different entrance doors to the property, one leading into the living rooms and one leading directly into the kitchen. Entering via the living room door, we are granted by a spacious lounge area with a great size wood burning stove. There is plenty of room here for a dining room table also so this space could easily be turned into a spacious family room. Off of this room there is a bathroom which is perfect for visitors so they don’t have to go upstairs. Through a small archway we have the kitchen. The kitchen was fitted only a month ago so it practically brand new. It’s a simple white gloss kitchen but with a typical Portuguese design splash back, adding some beautiful colour to the room. Now going upstairs via the wooden staircase, we have landing area with two bedrooms to the left and the family bathroom and the third bedroom to the right. All of the bedrooms are extremely good sizes and easily all fit double beds. 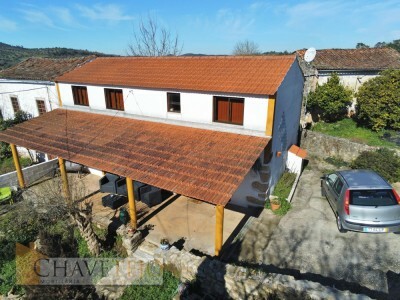 The house is situated in the centre of Chãos, so is within walking distance to cafés, public transports and a weekly market. Also in Chãos is a cash machine, post office, doctors surgery and post office.